It is always a pleasure to share our blog pages with like-minded people. Save Our World aims to raise awareness of environmental issues – empowering people to make a difference through making positive choices to help the planet everyday – starting in the Middle East. Learn how Colette Barr engages and educates children on sustainability-related topics, and instills environmental awareness from an early age through ‘The Eco-heroes’. Please share this blog post with your social circles. The more awareness, the more we help our planet. We have created a series of five children’s environmental books. 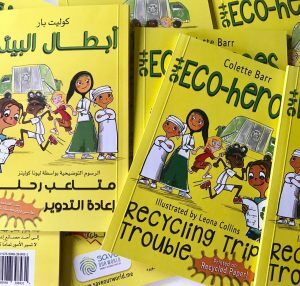 The first Eco-heroes book was launched in October 2018, based on recycling and e-waste. The others will be based on food waste, plastic pollution, alternative energy and water conservation. They follow five school children in the United Arab Emirates (UAE), who get up to mischief and learn some important environmental lessons along the way. The books are for ages ranging from approximately 6-10 years old. The second book will be launched in February 2019, tackling food waste. As soon as that book is launched, we will be working on our plastic pollution book for its launch in April 2019 with the other two books in the series coming closely behind towards the end of this year. We set up a company, Save Our World FZ LLC, in order to self-publish the books and have had them printed in the UAE on recycled paper, using the Dubai font and only local suppliers. We wanted the books to be from the UAE for the UAE, tackling important global issues on a local level. They are available in English and Arabic. We are really excited, as we have received fantastic reactions so far and have been invited to take part in the Emirates Airline Festival of Literature 2019, as part of its Education Programme in March. I believe that our biggest issue today is the fact that we have climate change stemming from human impact, and the global food and energy crisis. I’ve travelled extensively and worked in developing countries severely impacted by war. I have seen examples of what works and what doesn’t work in relation to corporate and government support, and truly admire the efforts of some amazing organisations, charities, campaigns, governments and individuals working to find and implement solutions for our world’s growing needs without causing harm to people or the environment. So, sustainability is a survival thing and is really important to us all. People hear about these issues and believe they are someone else’s problems. They are our problems and we all need to work together to fix them. When people believe that they can make a difference, they do, and so it’s understanding the link between actions and impact which is key. We are all in this together and can help each other live better, healthier, more sustainable lives. We all have a part to play in preserving this amazing world and to make the UAE a better, more sustainable place to call home for generations to come. I was feeling unfulfilled in the corporate world and wanted to do something meaningful – and which hopefully – makes an impact. I was scared to make the jump and it took me a long time to gather the courage to do it, but I am so glad I did. It’s the right thing to do. I honestly, truly believe that I can help bring change for the better and ‘The Eco-heroes’ is the first idea I thought of to do that. I was talking about my ideas to my neighbour and now Creative Director, Leona Collins, and she loved the idea and wanted to be involved. She brought the stories and characters to life with her fantastic illustrations. 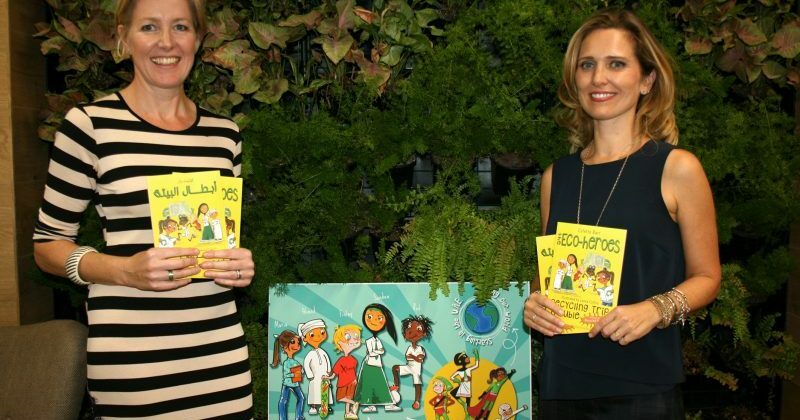 We wanted the books to be relevant to children living in the UAE, because there has been less environmental awareness here than in some more established places such as Europe, for example. The UAE is a new country and has grown unbelievably since its inception. However, that also means that some of the waste management infrastructure and environmental awareness levels have not yet matured. We want the UAE to continue to be an amazing place, and want children to be fully aware of how they can have a huge impact on that. Having local characters and stories based here, seemed like a pretty good way of getting the message across and so far the response has been excellent. Reading, touching and feeling a real physical book is such a valuable way of learning, so making the books a reality seemed like a fun and obvious way to raise environmental awareness. The books are available to buy on our website www.saveourworld.me, where children can learn some facts linked to the topics of each book. We have added a resources page for teachers and children with links to loads of different sites and activities, and will continue to build on this throughout the lifetime of ‘The Eco-heroes’ project. We are speaking to schools, collaborating with partners, raising sponsorships, and continuously seeking new and exciting ways to bring more value to our sessions and to promote our books. We are also seeking government grants and funding to help us continue our works, as this is really something relevant and important to all of us in the UAE. Follow Save Our World on Instagram, Twitter and Facebook.